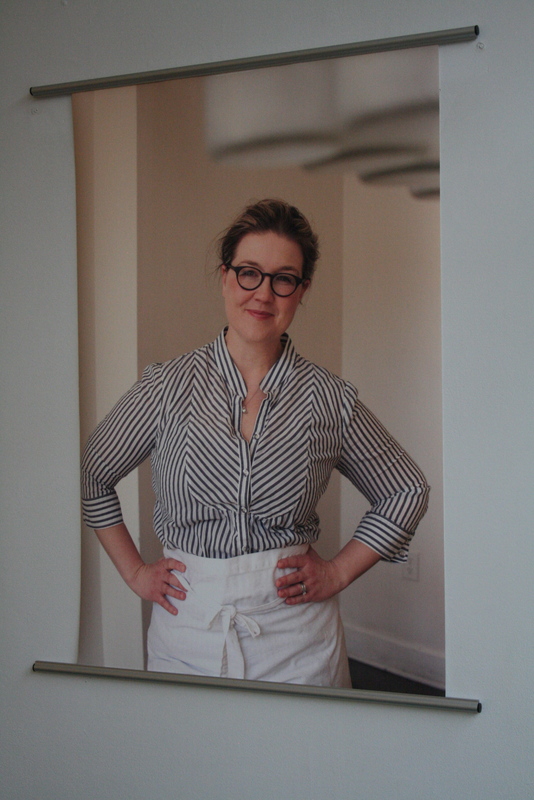 I don’t remember when I first discovered Jeni’s Splendid Ice Creams–I was familiar with the OUTRAGEOUSLY priced pints ($10 each at Dorothy Lane Market!) before I first tried their “Salty Caramel” flavor at Susy’s house. It was amazing. Salty Caramel is perhaps their best-selling flavor; it’s slightly creative without being too off the wall. 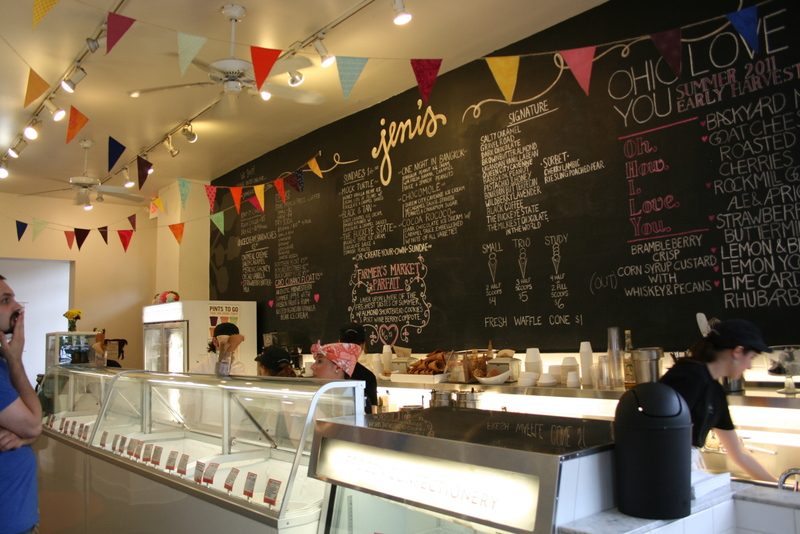 That’s the thing about Jeni’s–they don’t have just plain vanilla or chocolate or cookie dough. 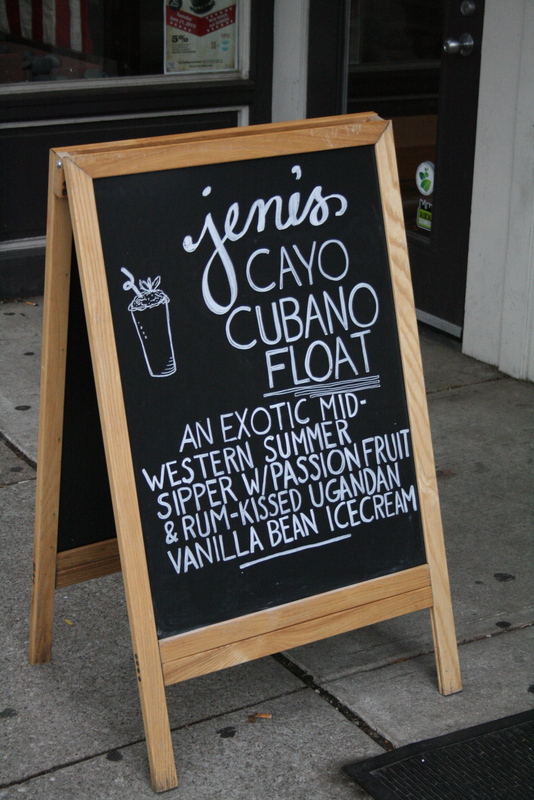 They offer flavors like Ugandan Vanilla Bean and Riesling and Poached Pear. Seriously, they do. And they all taste exactly how they sound. Andrew and I made a pit stop on our way up to NY Sunday. 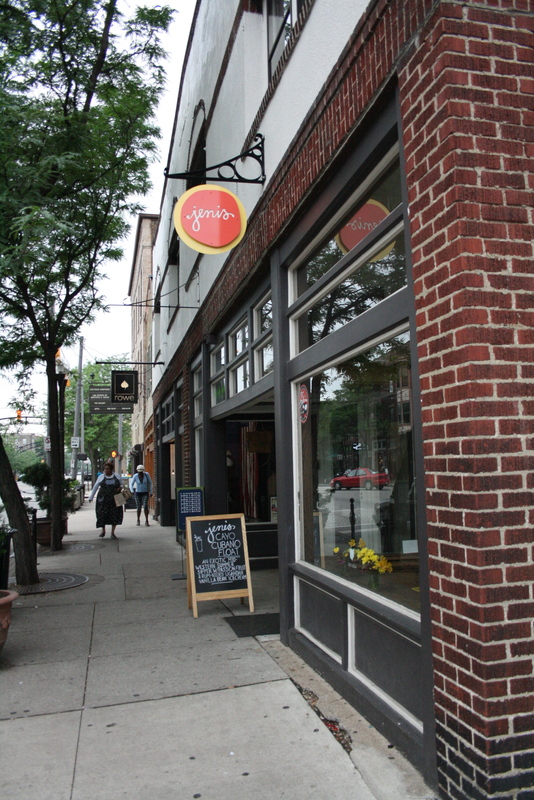 Jeni’s has seven (I think) locations in the Columbus area, and we always go to the High Street shop when we’re in Short North. It’s on the corner of Lincoln and High Streets. I love chalkboard signs. They make me want to have my own little shop so I can write on them. This is what you see when you walk in. Well, not everyone gets to see a very indecisive Andrew looking much like ‘The Thinker.’ That’s it–he can’t give me any more crap about taking too long to decide what I want to eat. I now have proof he has his moments of indecision, too. Thank goodness for the explanation of flavors! 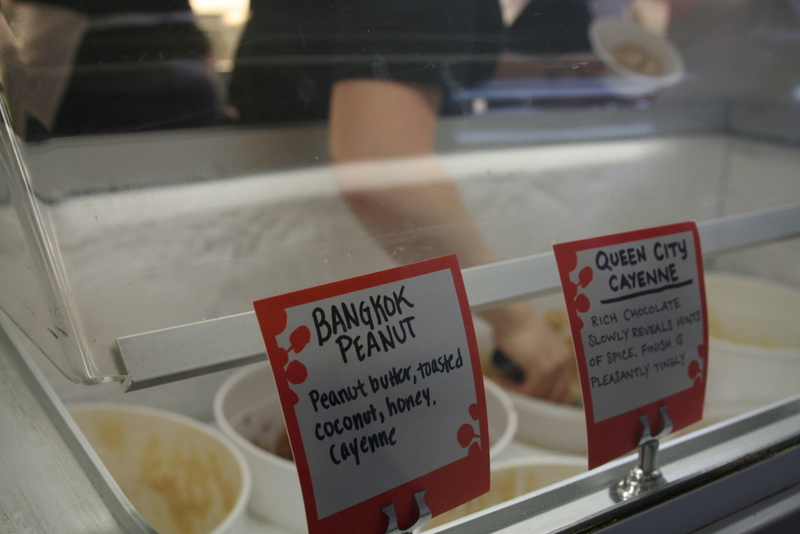 I’ve had Bangkok Peanut before, and it’s HOT. I love that every flavor is so fresh. For example, the Lime Cardamom with Rhubarb you see above was just Lime Cardamom this spring when we were here for Dave’s track meet and stopped in Easter Sunday (They were open on Easter Sunday, of all days! 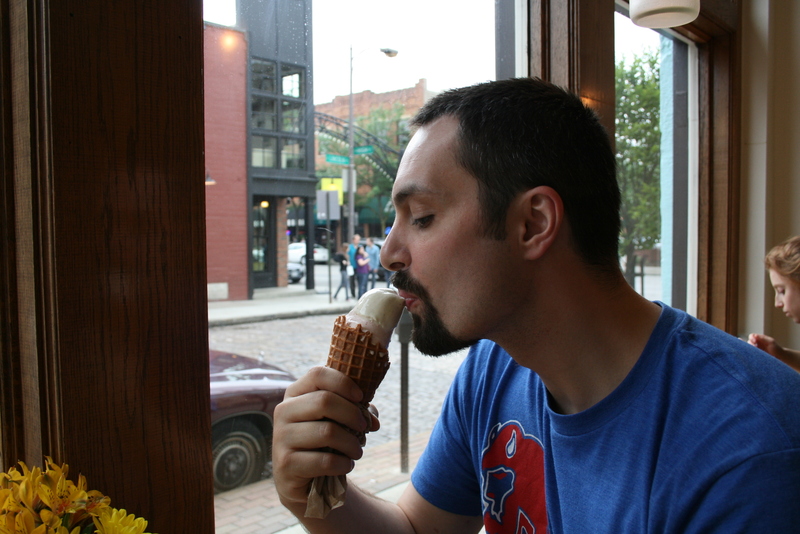 while I thought it highly sacrilegious, I was happy to have some Jeni’s). It was yummy then, and it’s only better with the addition of rhubarb. This is Jeni. I love funky glasses. I was actually a teensy bit disappointed when I got PRK a couple years ago knowing I wouldn’t need glasses for another 15 years. They can be such statement pieces without even trying. Anyway, about Jeni. She certainly looks proud of herself; and she should be. She’s doing something she loves and worked hard enough and was blessed with enough luck to actually make it big. You go, girl! This is Andrew thoroughly enjoying his ice cream. He got Ugandan Vanilla Bean (his usual), Strawberries and Buttermilk, and something else. I can’t remember and it was hidden at the bottom of his cone. Side note: the t-shirt he’s wearing is from Homage, a vintage t-shirt store off Pearl Street behind Jeni’s. We stumbled upon it after dining at Tasi, a French bistro also behind Jeni’s, when we were here for the Family Life Marriage Conference a few months ago. Anyway, we LOVE Homage and Tasi. You must visit both next time you’re in C-bus. 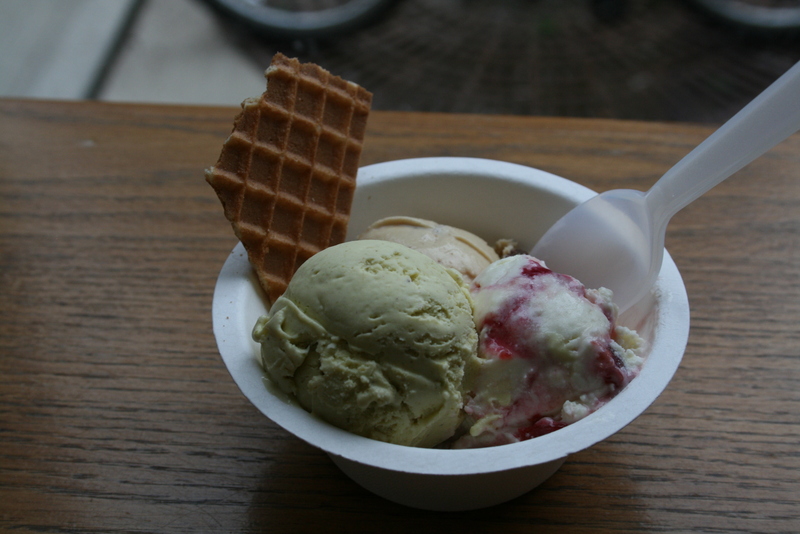 I got Bourbon Buttered Pecan, Sour Cherries and Goat Cheese, and Pistachio and Honey–YUM. 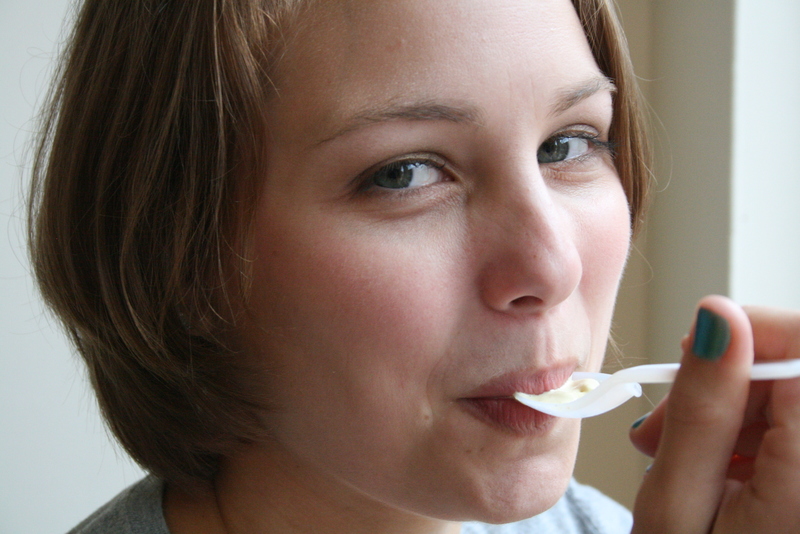 The Pistachio and Honey was awesome–I saved it for last. It was slightly salty, slightly sweet and a little nutty. 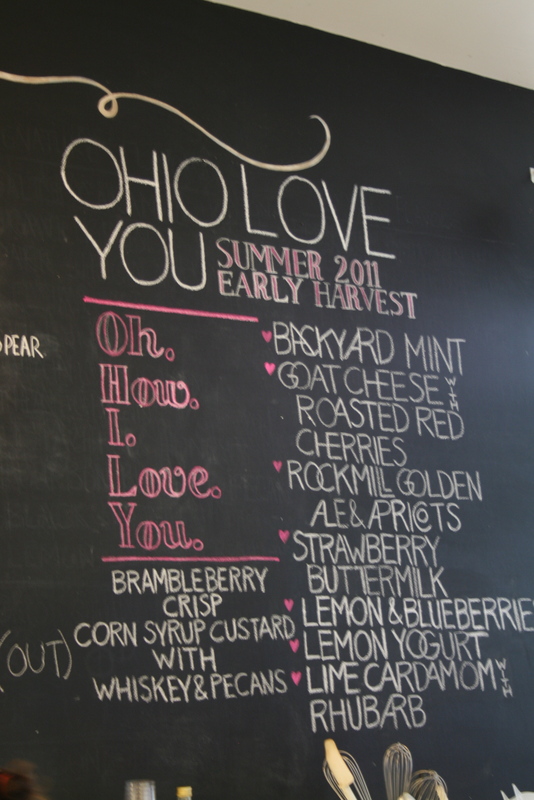 Posted on June 25, 2011 February 28, 2016 by thehealthypineapplePosted in Slice of Life, TravelTagged columbus, Ice Cream, jeni's, Ohio.